In Chinese folk religion and Chinese mythology, the Kitchen God, named Zao Jun (Chinese: 灶君; pinyin: Zào Jūn; literally "stove master") or Zao Shen (Chinese: 灶神; pinyin: Zào Shén; literally "stove god"), is the most important of a plethora of Chinese domestic gods (gods of courtyards, wells, doorways, etc.). In this religio-mythic complex, it is believed that, in the days leading up to Chinese New Year, the god returns to Heaven to submit his annual report on the family members' activities to the Jade Emperor (Yu Huang), who rewards or punishes the household accordingly. 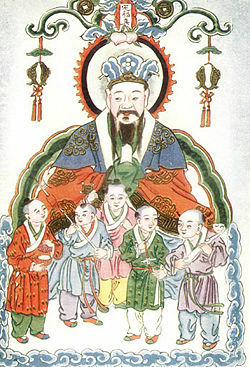 The cult of Zao Shen has been an active part of popular Chinese religion since at least the second century B.C.E. Though no definitive sources exist, there are many popular accounts describing the events leading up to the god's apotheosis. In the most popular, it is suggested that he was once a mortal man named Zhang Dan (張單) (also known as Zhang Ziguo 張子郭), who was married to a virtuous woman. Unfortunately, Zhang Dan became utterly entranced with a young trollop, and, in his smitten state, sent his wife back to her parents in order to be with this exciting new woman. From that day on, however, Heaven afflicted him with ill-fortune in order to punish him for cruelty and thoughtlessness: specifically, he was struck blind, the young girl abandoned him, and he had to resort to begging to support himself. While begging for alms one day, he unknowingly happened to pass the home of his former wife. Despite Zhang's shoddy treatment of her, the kind woman took pity on him and invited him in, where she tended to him lovingly and cooked him a meal of his favorite dishes. The foolish man was then utterly overcome by pain and self-pity as he realized the depth of his error, and he began to weep bitterly as he told the woman about his mistreatment of his caring wife. Hearing him apologize, Zhang's former companion urged him to open his eyes, at which point his vision was miraculously restored! Recognizing his benefactress as his abandoned wife, he was overcome with shame and threw himself into the kitchen hearth, not realizing that it was lit. Alternatively, Zao Shen was a man so poor he was forced to sell his wife. Years later, he unwittingly became a servant in the house of her new husband. Taking pity on the destitute man, she baked him some cakes into which she had hidden money, but he failed to notice and sold them for a pittance. When he realized what he had done, he took his own life in despair. In both stories, Heaven takes pity on the foolish husbands and, instead of becoming a vampiric Jiang Shi (the usual fate of suicides), they are invested with the posting of kitchen god and allowed to be reunited with their lost loves. In addition to the stories describing the origin of the Stove God as a deity, the mythic corpus also contains a popular tale about the first instance of a sacrifice to the kitchen god. In it, the god grants a Daoist magician named Li Shaojun two invaluable boons: eternal youth and freedom from the need for sustenance. In a fit of hubris, the young spiritual master appeared before emperor Xiao Wudi (140-86 B.C.E.) and promised him the same magical abilities if he offered sacrifice to Zao Shen. Though the ruler considered ignoring this request, he is reported to have been visited in a dream by the god, who convinced him that Magician Li was reputable. In hopes of achieving immortality, the emperor consented to offer sacrifice to the god. Unfortunately, the desired response was not achieved and Li was eventually killed for wasting his majesty's time. Regardless of these inauspicious beginnings, the emperor's sacrifice was still seen as an important religious milestone, with offerings to the Stove God playing an ever-increasing role in Chinese religiosity from Magician Li's time to the present. In traditional Chinese households (both in China and abroad. ), the stove area is adorned with a paper effigy of Zao Jun (who was understood to analyze everything that transpires in the home) and his wife (who acts as his scribe), a pair of deities that document all of the year's happenings and report them back to Yu Huang. This important (and somewhat daunting) responsibility has greatly increased the spiritual charisma of the god's office, such that many devout families make offerings of food and incense to the god on his birthday (the third day of the eighth lunar month), on the first and fifteenth of every month, or, at very least, on the twenty third day of the twelfth lunar month, when he is thought to return to Heaven to give his testament to the Jade Emperor. As the Stove God's report is understood to affect the family's fate in the upcoming year, it is considered prudent to offer him a bribe, smearing the effigy's lips with honey or malt taffy (which is understood to either figuratively "sweeten his tongue" or to literally glue his lips shut). ; After this, the effigy is burned, which is understood to translate it into the spiritual realm, and firecrackers are lit to speed the deity on his way to heaven. If the household has a statue or a nameplate of Zao Jun, it is then taken down and cleaned. If not, a new image of the deity is purchased and hung up on New Year's Day, in commemoration of the god's return. The paper image was carefully carried into the open courtyard. Wealthy people provide a paper palanquin in which the deity was carried. The carrier had to be careful to keep the image always facing south. The palanquin or the image was put down in the court and silver paper money was placed before it. The father prayed that when the God arrives in Heaven, he will keep the faults of the family to himself, and that, if they have been negligent in serving him, him will be lenient. The image was then burned, the children set off strings of firecrackers, beans were thrown on the roof of the house to simulate the sound of horses' hooves, and Tsao-wang [Zao Shen] ascended to Heaven. Sometimes the image was dipped in wine before being burned in the hope that a tipsy Tsao-wang will be too happy to say anything disagreeable. The fire in the kitchen was put out and should not be relit until the deity returns at New Year's. The children were then given all the candy to eat. Seven days later ([which] is the on which Tsao-wang returns home), he was welcomed with more firecrackers, another feast, and a new paper image was put in the shrine. During the week that Tsao-wang was in Heaven, there is no little watch-bird to keep track of family doings so they were free to gamble or indulge in other pleasures. In keeping with her thematic interest in traditional and modern China, Amy Tan's novel The Kitchen God's Wife interweaves Zao Jun's story (with a feminist spin) into the stories of the book's protagonists, a Chinese mother and daughter. ↑ Stephan Shuhmacher and Gert Woerner (eds.) The Encyclopedia of Eastern Philosophy and Religion: Buddhism, Hinduism, Taoism, Zen. (Boston: Shambala, 1994), 382. ↑ Anne S. Goodrich. Peking Paper Gods: A Look at Home Worship. (Monumenta Serica Monograph Series XXIII. Nettetal: Steyler-Verlag, 1991), 40-41. ↑ Werner, 519; Shuhmacher and Woerner, 382. ↑ Venetia Newell, "A Note on the Chinese New Year Celebration in London and Its Socio-Economic Background." Western Folklore 48:1 (January 1989). ↑ Newell, 64 ff 5. ↑ Amy Tan. The Kitchen God's Wife. (Penguin, 2006. ISBN 0143038109), 52-57. Chard, Robert L. "Rituals and Scriptures of the Stove Cult." Ritual and Scripture in Chinese Popular Religion: Five Studies. Publications of the Chinese Popular Culture Project 3. Berkeley, CA: Chinese Popular Culture Project, 1995. ISBN 0962432733. Goodrich, Anne S. Peking Paper Gods: A Look at Home Worship. Monumenta Serica Monograph Series XXIII. Nettetal: Steyler-Verlag, 1991. ISBN 380500284X. Newell, Venetia. "A Note on the Chinese New Year Celebration in London and Its Socio-Economic Background." Western Folklore 48:1 (January 1989): 61-66. Shuhmacher, Stephan and Gert Woerner (eds.) The Encyclopedia of Eastern Philosophy and Religion: Buddhism, Hinduism, Taoism, Zen. Boston: Shambala, 1994. ISBN 0877739803. Werner, E.T.C. 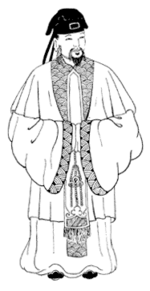 "Jade Emperor" in A Dictionary of Chinese Mythology. Wakefield, NH: Longwood Academic, 1990. 341-352. ISBN 0893410349. This page was last modified on 4 April 2008, at 02:40.